Sunday was the first big nor’easter to hit the Boston area for the season. 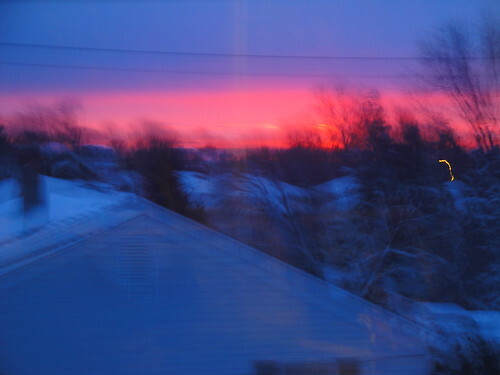 Since it was a weekend, rather than being a horrific nuisance, the storm became a boon – the perfect excuse to remain in the house and pajamas all day and just cook! 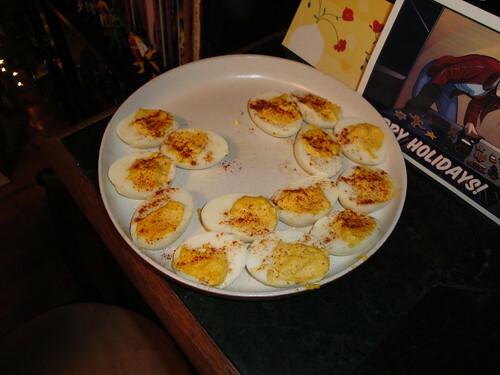 Deviled Eggs: these are made with homemade mayonnaise. If you have a food processor this becomes the easiest thing in the world, and tastes much lighter than what you buy at the store. 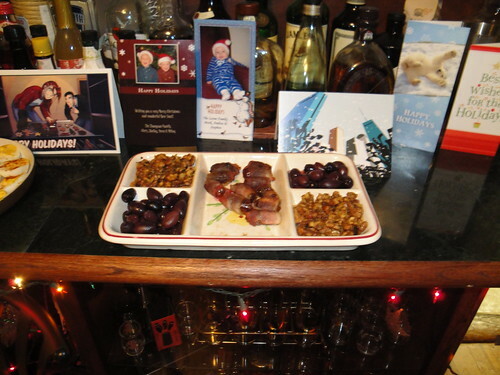 Rosemary Roasted Walnuts: On the sides of the above picture. These are hopelessly addictive, and just about the easiest hors d’oeuvre I can possibly imagine. A little salty, a little sweet, with the resinous must of rosemary and the bite of black pepper, they’re a perfect cocktail snack. 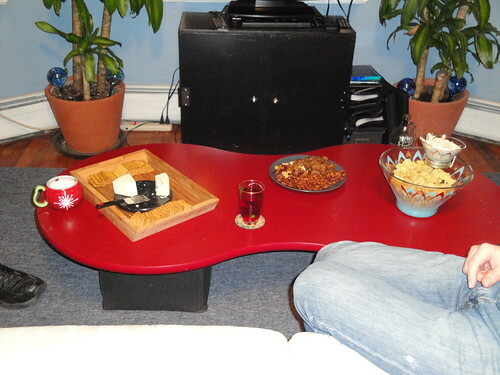 There was also cheese and some chips and dip, the latter serving primarily to showcase my awesome chip and dip bowl. See? The pictures of the cookies will be revealed later in the week (or in my Flickr right now if you’re impatient) but I will tell you that it takes a good hour and a half and a solid rolling, cutting, baking and removal system to get them all done. The house smelled enchanting! But wait, there’s more! In addition to party prep, Mr. Menace and I prepared not one, not two, but THREE meals to be enjoyed this week! 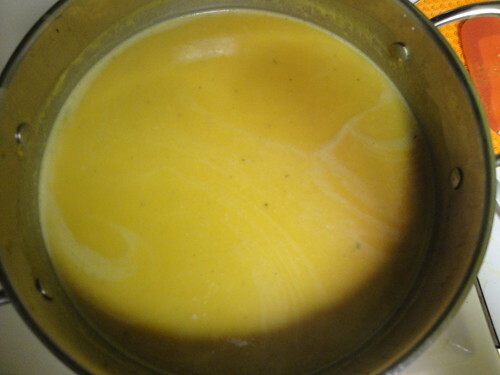 First, using the amazing turkey stock that I’ve been telling you about, we made a lovely soup. This served two purposes, in that besides having excellent soup to eat this week, we also did a bang-up job in cleaning out the fridge! This soup is chock-full of vegetables, barley, and oyster mushrooms and is so filled with umami goodness that you wouldn’t even notice that we didn’t add meat! Next, Mr. Menace made some outstanding stuffed manicotti. Ground beef, cheese, onions and mushrooms all stewed together gently before filling pasta and baking under a blanket of mozzarella cheese. This was our Sunday dinner and it was very satisfying on a cold, snowy evening. Finally, we took the remaining ground beef and made mini-meatloaf! The larder is stocked! What did you do with your snowy day? I am not the easiest person with whom to share a kitchen. Sure, I might let you chop up some vegetables, and certainly any help in washing the dishes is greatly appreciated. But by and large, I am a territorial kitchen beast who will politely but firmly tell you “No, thank you,” should you offer to assist in the making of a meal. In part this is due to my tendency to make a gigantic, frantic mess while cooking. I’ve got nine things going on at once and it’s way too stressful to tell you what’s going on in my head so why don’t you just let me do it! However, I am trying to be more enlightened in my approach and learning the joys of joint projects, because while not many people realize this, my guy is a pretty good cook in his own right. Additionally, if we’re going to spend time together it only makes sense to do some collaborative projects. I’m not going to sculpt with him, and he’s not going to learn to knit, but we both cook and eat, so it makes sense that I learn to make room for him. So we’ve been working on projects that play to our individual strengths. Pizza is our crowning achievement – I make the dough, he stretches it. He cuts onions, I caramelize them. There’s a beautiful harmony to our work together. So we recently branched out, and I’m delighted to say it was a huge success! This weekend, my fella and I made chicken pot pie together! Not only was it a great pot pie, but it highlighted the true importance of collaboration; namely, a pot pie is a lot of dang work, and I think either one of us would have been exhausted and frustrated to tackle it on our own. 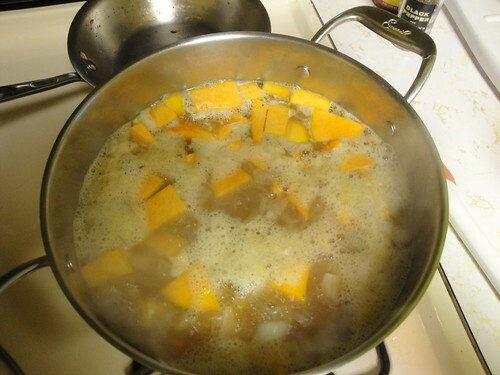 For starters, we made our own stock for the gravy from the carcass of his family’s Thanksgiving turkey. That took several hours of boiling and pot tending – I took the first shift, and he the second since he stays up quite a bit later. The result was some of the richest, most beautiful turkey stock I’ve ever seen or smelled. I braised some endives with just a bit of it and it was all I could do not to lick the pan. Next, the pastry needed to be made for the pie. This was my job, and while it didn’t take too long thanks to my glorious food processor, it needs to be done well ahead of time to be effective. The gluten in your pie crusts needs to rest, otherwise it’s all short and tough! I used the crust from this recipe. Alas, we didn’t have enough ingredients to use the filling listed in that recipe, nor any need for so much pot pie. 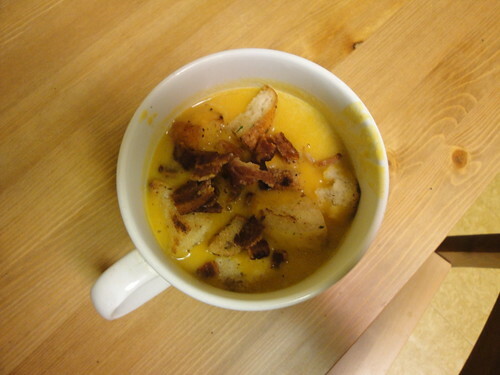 So further work went into researching a new recipe for that. 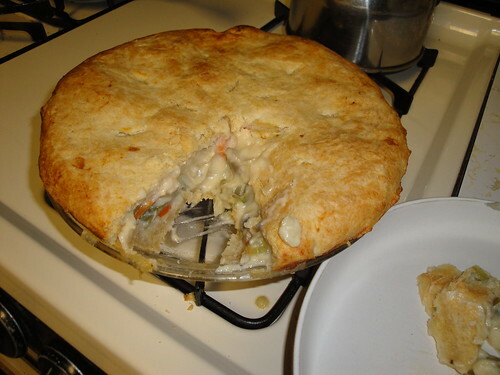 We did mash up the recipes into a sort of uber-pot pie. Incidentally, only one of the multitude of cookbooks we own had any recipe for pot pie. What’s up with that, modern cookbooks? 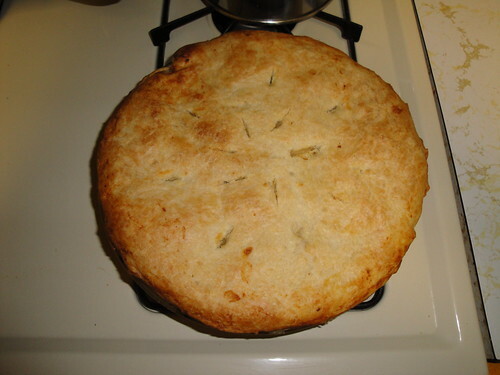 Do people not make pot pie from scratch any more? Is it because you need at least THREE hours to do so? But I digress. The crust completed, my guy took on the task of creating the filling, rolling out the dough, and baking our little treasure until it was golden brown. I came home from work to that beauty cooling on the stove. Just look at the inside! Absolutely gorgeous. With results this good, how can I keep the kitchen to myself?